Analytical nanoscience and nanotechnology is a growing topic that is expected to have a great impact in the field of analytical chemistry. Many of the exceptional properties of gold nanoparticles make them suitable for different analytical applications and these applications allow extrapolations for their use in other fields as well. In analytical chemistry gold nanoparticles play two main roles, namely: i) As target analytes in the realm of the analysis of the nanoworld; and ii) As tools to improve analytical processes, such as the use of gold nanoparticles as components of electrodes, in spectroscopic techniques and (bio)chemical sensors and lateral flow sensors. 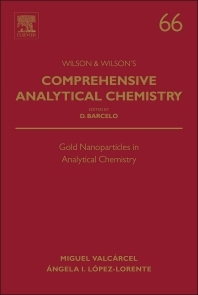 This book is a comprehensive review of the role of gold nanoparticles in analytical nanoscience and nanotechnology, with chapters devoted to their synthesis, physico-chemical characteristics, derivatization and potential toxicity. The main microscopic, spectroscopic and separation techniques for the characterization are reviewed as well as the developments for their determination in environmental, biological and agrifood samples. 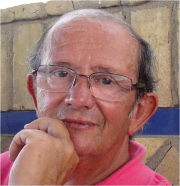 Dr. M. Valcárcel is full professor of analytical chemistry at the University of Córdoba since 1976. He is the author and co-author of 850 scientific articles (with a Hirsh factor of 49), 7 monographs, 8 textbooks and 16 chapters of books. He was the coordinator of 25 Spanish scientific research projects and 14 of international nature, as well as 12 contracts with private firms and promoter of a spin-off devoted to nanotechnology. Prof. Valcárcel has been the co-supervisor of 70 doctoral thesis and an invited lecturer in 70 international meetings. He is the recipient of relevant scientific national (e.g. Award in Chemistry in Spain, 2006) and international (e.g. Robert Boyle Medal of RSC, 2004) prizes as well as Doctor Honoris Causa from the University of Valencia (Spain, 2010). Dra. Ángela I. López-Lorente received her Ph.D. in Chemistry from the University of Córdoba (Spain) in 2013 and holds an Advanced Fine Chemistry Master and Chemistry degree from the same institution. During her Bachelor of Chemistry studies she obtained a special scientific recognition from the Spanish Ministry (Arquimedes’ Contest) for her work on membranes based on carbon nanotubes. In 2010, she received the Spanish National Award for Graduate Studies in Chemistry. Her research has concentrated on the development of analytical methodologies for both the characterization and determination of nanoparticles such as metallic nanoparticles or carbon nanotubes in environmental and biological matrices. During her doctoral studies she performed a research stay at the group of prof. Mizaikoff in the University of Ulm (Germany). Her doctoral thesis has been the recipient of the Lilly Research Award for PhD Students 2013 and the prize of the Andalusian Group of the Spanish Analytical Chemistry Society.